Classic French Demi-Glace made in the old world tradition of Escoffier from brown stock and Sauce Espagnole. 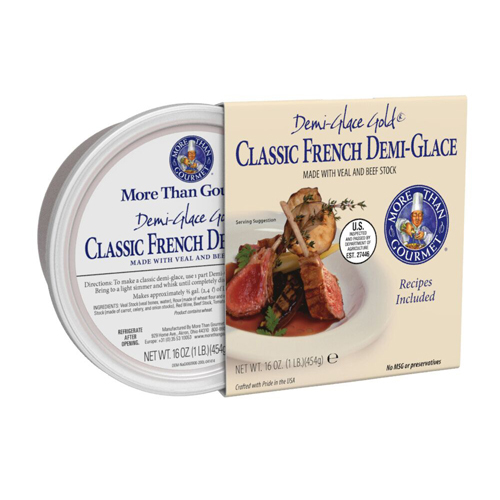 Demi-Glace Gold is reduced four times from the classic and allows you to make elegant finished French Sauces quickly and easily. Low heat cooking techniques and 30-hour reduction process give the product a beautiful shine, flavor and texture, which make finished sauces that are glossy to the eye and decided in taste. Makes approximately 2/3 gallons (2.4l) of classic demi-glace. Makes veal stock up to 1 gallon (3.78l) of classic use as is for glace de viande substitute.